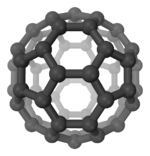 Dicarbon monoxide (C2O) is molecule that contains two carbon atoms and one oxygen atom. It is a linear molecule that, because of its simplicity, is of interest in a variety of areas. It is, however, so extremely reactive that it is not encountered in everyday life. It is classified as a cumulene and an oxocarbon. It is stable enough to observe reactions with NO and NO2. Called ketenylidene in organometallic chemistry, it is a ligand observed in metal carbonyl clusters, e.g. [OC2Co3(CO)9]+. Ketenylidenes are proposed as intermediates in the chain growth mechanism of the Fischer-Tropsch Process, which converts carbon monoxide and hydrogen to hydrocarbon fuels. The organophosphorus compound (C6H5)3PCCO (CAS# 15596-07-3) contains the C2O functionality. Sometimes called Bestmann's Ylide, it is a yellow solid. ↑ Bayes, K. (1961). "Photolysis of Carbon Suboxide". Journal of the American Chemical Society. 83 (17): 3712–3713. doi:10.1021/ja01478a033. ↑ Anderson, D. J.; Rosenfeld, R. N. (1991). "Photodissociation of Carbon Suboxide". Journal of Chemical Physics. 94 (12): 7857–7867. doi:10.1063/1.460121. ↑ Thweatt, W. D.; Erickson, M. A.; Hershberger, J. F. (2004). "Kinetics of the CCO + NO and CCO + NO2 reactions". Journal of Physical Chemistry A. 108 (1): 74–79. doi:10.1021/jp0304125.